“Tonight we were down early, we were down big and I just tried to be aggressive and go get a bucket,” Durant said. Lowry’s 3-pointer with 55 seconds to go in the fourth quarter put the Raptors up 119-113 but Durant replied with back-to-back 3s of his own, including a game-tying shot with 8.6 seconds left. “When he’s feeling it, there’s not a whole lot the defense can do,” Kerr said. Leonard drove and kicked to Ibaka on the final possession, but the Raptors big man couldn’t get a shot off before the buzzer. 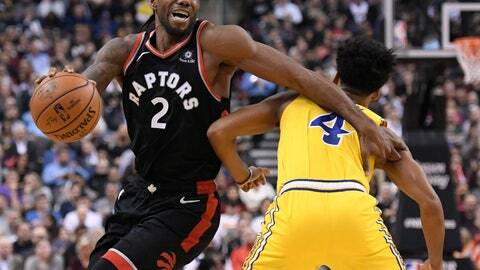 Jerebko’s dunk cut the gap to three but Toronto caught another break when Iguodala was called for travelling. Siakam was fouled and made one, with Leonard grabbing the rebound on the missed second shot. Siakam was fouled again, and capped it with another pair from the line. “They did a really good job of throwing that first punch,” Iguodala said. Warriors: Golden State has lost five straight on the road. … Kevon Looney matched a season high with 10 rebounds. … This five-game trip matches Golden State’s longest of their season. Raptors: Toronto shot 16 for 22 in the first, going 6 of 10 from 3-point range. The Raptors were just 1 of 7 from beyond the arc in the second. … Leonard scored 22 points in the first two quarters, a season high for any half. … Toronto Maple Leafs coach Mike Babcock sat courtside. “The rental expired,” Nurse joked. Kerr, who dressed more conservatively, said Nurse “definitely nailed” his colorful coat.